I just got a Oster bread maker. Will gluten free flour rise when making rolls? I’m trying the bread cycle to make a loaf of bread. I don’t have a gluten free button. Hi Teri, the key to gluten free rolls rising is to shape them first, then let them rise. If you want to make rolls with your bread machine, take the dough out right after mixing and before rising. Shape the rolls or put them into pans and then let them rise there before baking. Hope that helps! Here are some more tips for GF bread baking. What is your experience with Breville Bread Makers? It has a GF setting… I just got mine. I love Breville products and find them extremely efficient and worth the money. I can’t wait to hear what you think of it, Jenny. Breville is almost the only brand I haven’t yet tried! Are you able to say if this breadmaker (link to manual for Tefal OW300170) would be suitable for GF breadmaking? Thanks! Hi Kris, looks like there’s no GF setting on this machine. There is a super fast bread setting that skips the punchdowns, but it also doesn’t bake as long so I’m not sure the loaf would finish baking all the way. If you can, I’d suggest this T-fal instead. Here’s my review of that machine: http://gfjulesnew.wpengine.com/t-fal-gluten-free-bread/. I have the Zojirushi breadmaker. I read that you have it too. Did you change the setting for the gluren-free cycle? The manual says that it will go through rise and punch down cycles. Your tips say that the bread should not be punched down. Hi John, the “punchdown” in the GF setting on the Zojirushi isn’t really much of a punchdown, so it’s fine to just use the GF setting. I did program it though, mostly because I don’t like waiting so long for the ingredients to come to temperature, because I add my ingredients at room temperature anyway. There is information in the article about what to set for programming, if you prefer. I make challah using the dough cycle of my bread machine. Can I just substitute GF flour to make this GF or is something else needed? Thank you. can I use the gluten free flour in place of regular flour, in a bread machine on the dough cycle? I want to make my challah GF and I normally make the dough in the dough cycle and finish it up by hand. Hi Irene, you can certainly use your bread machine to make the gluten free challah dough and then finish by hand. I think it’s just as easy to use a mixer since there’s no kneading involved with GF doughs, but it’s up to you. Have you tried my GF challah recipe? It’s a winner! Hi Cathie, do you use the machine to mix the dough, then you shape and bake it like regular challah, or do you use the machine to bake the challah dough as a loaf? Can I purchase your gluton free bread mix in Canada? We don’t currently sell in any stores in Canada, but we do deliver to Canada. It can be rather pricey to ship from the US, so a lot of my customers have flour delivered to friends in the US who ship to them. We do offer it as an option though, just so you can still have access. We’re working on finding other ways to get my products to our friends over the border with less expense. I hope this helps! Really, you have to mention something negative about TSA in a recipe for Gluten Free Bread. I am so sad, and have been crying…do you have a basic GF bread recipe specifically for a bread maker? These mistakes are costing me a lot for GF flour. It is difficult to buy here where it is a rural area. The flour is: PC gluten-free all purpose flour blend. The ingredients are: tapioca starch, modified potato starch, corn flour, modified cellulose, xanthan gum. Pleassssssssssse. Can you help? Hi Carolyn, I’m happy to help! I must say I’m not familiar with PC flour mix, and all gluten free flour mixtures work quite differently, based both upon the ratios of whole grains to starches and upon the exact flours used. Have a look at this basic sandwich bread recipe and scroll to the bottom of the directions for making in a breadmaker. If you try it with your flour blend and think you’re on the right track but it’s not as delicious as it oughta be (and it IS delicious! ), I encourage you to try my gfJules GF blend. We ship right to your door so even folks in rural areas can have access. You can even try a sample for just $5 including shipping. I want everyone to bake happy again, gluten free. No more tears (we’ve all been there, though!). Please have hope and know that this recipe is as good as it looks when made with my blend, and it’s even easier to just make it with my bread mix – dump the mix on top of the liquids and push the button! Can I find your flours in Australia? Thanks kindly. I’m glad you’ve found one that works for you, Amy! I agree that the mixes are often cheaper than buying the individual flours, also because sometimes you only need a little of one flour and a little of another, so the remainders end up going bad. That’s why I love my gfJules Bread Mix – it has all the flours and quick rise yeast included so you can just dump it in the bread machine with the liquids and push a button for picture perfect, delicious homemade bread. I’d love to hear what you think about my mix if you try it sometime! Hello! Thanks for all the awesome tips on this website! I have a brand new bread baking machine and have made two breads so far. The first one, a very basic one with brown rice flour and potato starch turned out alright, but the second one with almond flour and arrowroot starch not so much. It’s sunken in and totally underdone. :-(. I’ve yet to find any advice on the web about if you can use almond flour when baking with a bread machine. I have the Zojirushi and it does have a gluten free cycle. I assume i might have to select a different course when using almond flour (using blanched almond flour). Very grateful for any advice! Hi Anja – I don’t bake with almond flour as my primary flour. I use it here and there WITH other gluten free flours. Almond flour and coconut flour require different moisture levels than many other gluten free flours, so just subbing them in will throw off a recipe not originally written for them. Have you looked at any of the gluten free bread recipes on my site, or considered trying my gluten free bread mix? I use it in my Zojirushi bread maker all the time and in fact, when I travel to gluten free Expos around the country teaching how to make GF bread in a bread maker, I’m using my mix and the Zojirushi because I can always count on the results and I’m teaching more about technique than ingredients. Just something to consider. I hope this information has helped! Thank you so much, Jules. I will definitely check out the bread mix and the recipes. Yes, using almond flour was not a great idea for me so far. Someday I may try again to bake with it, but will mix it then for sure. Thanks so much for your time. Happy 2016! And you as well, Anja! Good luck with the bread baking! Just an FYI, beer bread by definition cannot be gluten free since beer is made from barley, whet, hops etc which are all gluten. You should update your comments above or some people may be confused and get sick from making “gluten free beer bread”! But thanks for all your info and tips, very helpful! Hi Diane, thanks for taking the time to leave a comment. While traditionally, all beer did contain gluten, there are now gluten-free beers available, but it’s good to point that out again here in this article as well. If you’d like some recommendations on gluten-free beers, take a look at my GF Beer Tasting Notes! Cheers! Hi. I have the Zojirushi bread machine. I want to make crescent rolls using your recipe in my bread maker. The problem is I can’t get your GF flour. I need to make this for Christmas Eve and there is not enough time to order. Can I use another brand of GF flour? What do you recommend? Thanks! Hi Jane, where do you live? There is still time to get my flour to you by Thursday and it’s also available in some stores around the country – you can check the listing here. Hi! I am wondering as a vegan what is the best alternative to use rather than eggs in a bread machine? It does not have a gluten free setting, so I would have to try to by pass some options. I really hate thinking about the billions of baby male chicks that are ground up alive only hours after hatching in the egg industry. Many of them are also suffocated in large plastic bags! This must be banned and people need to know that eggs are not “innocent” products but sources of suffering fro both the hens and the male chicks especially! Even “cage-free, range-free eggs” result in the deaths of male chicks! Anyone reading this-PLEASE think about that and use alternatives or go to a local farmer or a friend who has chickens that they just use for unfertilized eggs! Thanks!!! I have a long list of egg-free substitutes I recommend for different kinds of baking applications. You can check my article here, but I’ll tell you that I have great success using flaxseed meal + water in my yeast breads in place of eggs — I do it all the time! I hope you find the article helpful – you can bake nearly any of my recipes egg free, and you might also enjoy my book, Free for All Cooking, which has tons of egg-free vegan recipes! Do you ever make gluten free bread, with-out yest? Does your bread ever have a hole in it from the paddle? Hi Amy, I have an awesome yeast-free bread recipe in my GF Bread Baking E-book. I haven’t posted it on the blog yet, but it’s really, really good! Here’s the link to the e-book if you want to check it out: Bread Baking E-book. As for the hole from the paddle, you can take it out after the mix cycle, or just leave it in and know that there will be a small hole where the paddle was left behind. It happens with all the machines, so it’s up to you whether it’s bothersome enough to make you want to reach into the dough and remove the paddle before the bake cycle. At least you have options! Hi Jules, I just got the Cuisinart bread machine. Many of the recipes call for bread flour. Can I use your flour and add something to it to make it bread flour so I can make those or should I just stick with your recipes? I love yours with my stand mixer by the way. Hi Bonnie – good choice! I love that bread maker. I think the convection bake makes it work a little better than some other brands. Do check with an internal thermometer when the setting is finished, to be sure that the loaf is at least 205F. With some recipes, I’ve had to add time or put the loaf in the pan in my oven to add a bit more time. As for bread flour, unfortunately, wheat-based bread flour is high in protein and high in gluten, so using those recipes with my gluten-free flour won’t work out so well. I’d recommend sticking with my gluten-free bread recipes for best results. Iam looking for a gluten free and dairy free banana bread recipe to make in a bread machine. Dose anyone know of a good one? Hi Hailey, you could try any of my quick bread recipes and use that setting on your bread maker. With bananas though, you’ll definitely want to mash those before you add them to the bread maker, as the paddle won’t be able to handle that task. Here’s a good recipe for you to try. I just made your GF beer bread in my new bread machine using the GF setting. it was fabulous! the book that came with the machine only has 4 recipes for GF bread. so my question is can I made the other recipes using your flour and the GF setting on the machine? and can I made the pizza dough from the book and just substitute your flour? Hi Mauri, so glad you loved the beer bread in your bread machine!! I don’t know anything about the recipes that they offer in the bread machine book you have. I am often skeptical about trying them because they usually call for some odd-tasting or textured flours that require more moisture or fats to cover them up, which my flour doesn’t need. At least you have a great starting point by using my flour in the bread machine in my beer bread recipe. You can try others of my recipes in the machine, or if you try ones from that book and they don’t work so well, you can return to one you know will work great. As for pizza dough – do you have a stand mixer? I find it’s easier to make GF pizza dough with my mixer than in a bread machine. You have to take it out of the machine to bake the pizza dough anyway, so it’s really just acting as a mixer and bread machines honestly don’t make the best mixers! good point about the mixer – hadn’t thought about it that way! Thank you! Hi Heather – the last reader that asked me about this machine ended up calling Oster and they exchanged it for one with a GF setting because there was no way to manually override those settings. The other option would be to mix the dough separately and then put it into the bread machine pan and just set it for rise and bake (if that’s possible) or rise elsewhere and just set it for bake. I’d try calling Oster first, though — much easier to just start with a machine that does it for you! Do you have any yeast-free bread recipes? I have mild food sensitivity to gluten, wheat, dairy & many other things but a strong sensitivity or allergy to yeast. I really miss real bread or pizza or all the wonderful things that involve yeast. 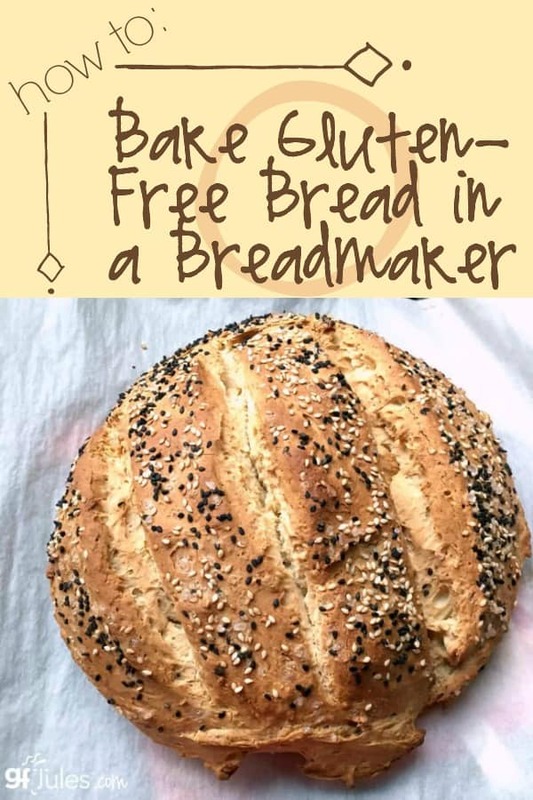 Hi Marilyn, I actually have a wonderful yeast-free sandwich bread recipe in my bread-baking e-book and here is my GF flatbreads recipe that is also yeast-free! We use it for pita, naan or pizza crusts! Is it necessary to use “bread machine yeast” when using a bread machine or can I just use the normal rapid rise yeast. Thanks. Hi Jules! I just got my bread machine (a Breadman with a GF setting) on Saturday and I used SAF Instant Yeast (since I am a TRUE novice at baking bread, my breads will be trial and error). I actually went on Amazon where they had a yeast comparison chart that really helped me. It was really surprisingly good for a first try! And it rose pretty well, too. I think it will be a trial and error thing unless some more experienced bakers would like to chime in!